When Google Earth was initially released in 2001, I immediately rushed to locate a village that no longer exists on a map and which now delineates a whole different reality. But I could only find it by estimation. Beit Daras was located 32 kilometers northeast of Gaza, on elevated ground, perched between a large hill and a small river that seemed to never run dry. A once peaceful village, Beit Daras had existed for millennia. Romans, Crusaders, Mamluks and Ottomans ruled over and even tried to subdue Beit Daras; yet they failed. True, each invader left their mark — ancient Roman tunnels, a Crusaders’ castle, a Mamluk mail building, an Ottoman khan (caravanserai) — but they were all eventually driven out. It wasn’t until 1948 that Beit Daras, that tenacious village with a population of merely 3,000, was emptied of its population and later destroyed. The agony of the inhabitants of Beit Daras and their descendants lingers on even after all these years. The tragic way it was conquered by invading Zionist forces has left behind bloodstains and emotional scars that have never healed. Three battles were bravely fought by the Badrasawis, as the dwellers of Beit Daras were called, in defense of their village. In the end, the Zionist militias, the Haganah, with the help of British weapons and strategic assistance, routed the humble resistance, which consisted mostly of villagers fighting with old rifles. The “massacre of Beit Daras” that followed remains a subdued scream that pierces through the hearts of Badrasawis. Those who survived became refugees and are mostly living in the Gaza Strip. 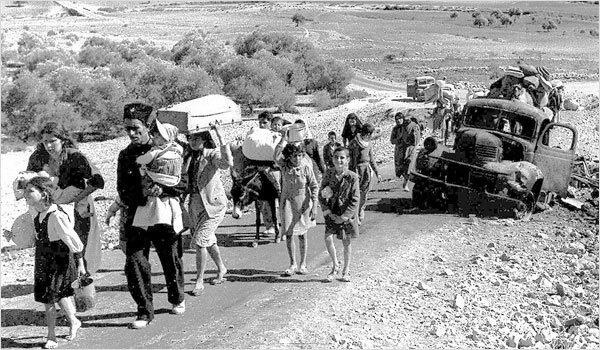 Under siege, successive wars and endless strife, their Nakba — the catastrophic ethnic cleansing of Palestine in 1947-48 — has never truly ended. One cannot dispel the pain if the wound never truly heals. Born into a family of refugees in the Nuseirat Refugee Camp in Gaza, I took pride in being a Badrasawi. Our resistance has garnered us the reputation of being “stubborn,” as well as the uncorroborated claim of having large heads. We truly are stubborn, proud and generous, for Beit Daras was erased but the collective identity it has given us remains intact. “Why bother to haul the good blankets on the back of a donkey, exposing them to the dust of the journey, while we know that it’s only a matter of a week or so before we return to Beit Daras?” he told his bewildered wife, Zeinab, as they hauled their children to navigate an endless exile. I cannot pinpoint the moment when my grandfather discovered that his “good blankets” were gone forever — that all that remained of his village were two giant concrete pillars, and piles of cacti. It isn’t easy to describe a history that, only seven decades ago, was, along with every standing building of that village, blown to smithereens with the intent of erasing it from existence. Most historic references written of Beit Daras, whether by Israeli or Palestinian historians, were brief, and ultimately resulted in delineating its fall as just one among nearly 600 Palestinian villages that were often evacuated and then completely flattened during the war years. It was another episode in a more compounded tragedy that saw the dispossession and expulsion of nearly 800,000 Palestinians. But, for my family, it was much more than that. Beit Daras was our very dignity. Grandpa’s callused hands and leathery, weathered skin attested to his decades of hard labor tending the rocky soil in the fields of Palestine. It was a popular pastime for my brothers and I to point to a scar on his body and have him tell us a gut-busting tale of the rigors of farm-life. The day grandpa died, his faithful radio was lying on the pillow close to his ear so that, even then, he might catch the announcement for which he had waited so long. He wanted to comprehend his dispossession as a simple glitch in the world’s consciousness that was sure to be corrected and straightened out in time. But it wasn’t. Seventy years later, my people are still refugees. Not just the Badrasawis, but millions of Palestinians, scattered in refugee camps all across the Middle East. Those refugees, while still searching for a safe path that would take them home, often find themselves on yet another journey, another dusty trail, being pushed out time and again from one city to the next, from one country to another, even lost between continents. My grandfather was buried in the Nuseirat cemetery, not in Beit Daras as he had wished. But he remained a Badrasawi to the end, passionately holding on to the memories of a place that for him — for all of us — remained sacred and real. What Israel still fails to understand is that the “right of return” for Palestinian refugees is not merely a political or even a legal right to be overpowered by the ever-unfair status quo. It has long surpassed that and moved into a whole different realm. For me, Beit Daras is not just a piece of earth but a perpetual fight for justice that shall never cease, because the Badrasawis belong to Beit Daras and nowhere else. Thanks for the nice remembrance. It pains.